Concrete Blonde grew out of the Los Angeles post-punk club circuit that produced bands like X, Wall of Voodoo, and the Go-Go’s, but it wasn’t until 1987 that the band even recorded its first album. The group was founded by singer/songwriter/bassist Johnette Napolitano and guitarist Jim Mankey, who initially called themselves Dream 6 and released an EP. Their insistence on complete artistic control was offputting to the major labels who took notice, however, and it wasn’t until 1987 that the group signed to I.R.S. and changed its name to Concrete Blonde at the suggestion of labelmate Michael Stipe. Concrete Blonde’s self-titled debut album betrayed the influence of the Pretenders, while 1989′s Free was a tighter showcase for Napolitano’s developing songwriting and produced a college radio hit with “God Is a Bullet.” The morose, textured Bloodletting, a more accomplished record than both of its predecessors, broke the band to a wider audience with the left-field Top 20 hit “Joey,” the tale of a love affair ended by alcoholism. 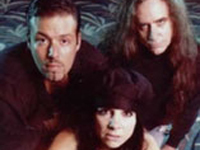 Mexican Moon reflected Napolitano’s interest in Hispanic music and culture, but Concrete Blonde’s commercial fortunes had declined since Bloodletting, and Napolitano broke up the band.